In an era of globalisation and digitisation, do we need new “digital taxes” or wholesale reform of the Corporate Tax system? We are now inviting contributions to the latest conversation for KPMG’s Responsible Tax project – curated by Jericho Chambers and co-authored with Chris Morgan, Head of Global Tax Policy, KPMG. Tax is rarely, if ever, out of the headlines: that is because it is a rare connecting point between the individual, civil society, the state and the corporate world. It is the lightning rod through which many complex and charged issues of social justice, the common good and rewards for enterprise meet and mix.We therefore need to develop tax policies that balance and re-balance the many issues that currently bedevil and divide our world: from boardroom and corporate excess, to low levels of productivity and investment; from inequalities between the global north and south to concentrations of wealth within nations; from climate change to mass population shifts; from issues of accountability and transparency, to rewards for hard work, enterprise, risk and endeavor. 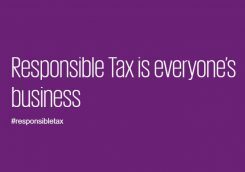 KPMG in the UK, and then KPMG International, launched the Responsible Tax Project with a singular thought: tax is the entry fee we pay for a civilised society. Without tax, there can be no roads, schools, hospitals, social care or security. The Responsible Tax Project has invited contributions from all corners of the debate: left to right; north to south; corporate to activist and NGO; policy maker to expert, academic and the media. Long may this last. Responsible Tax is the responsibility of us all – a civic negotiation, never a corporate or governmental imposition. By embracing multiple voices as equals, greater trustworthiness is built between stakeholders. The process is integral to developing the best outcome – good tax policy.